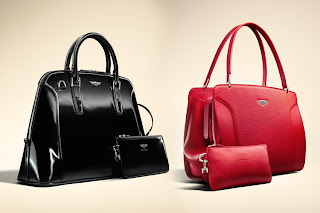 Bentley Motors announces the launch of the Bentley Handbag Collection at the prestigious Pebble Beach Concours d'Elegance 2013, the world's premier event for automotive enthusiasts and connoisseurs of culture. which is unique in the automotive industry, a reflection of the essential values for which Bentley is renowned worldwide - an exquisite design aesthetic, highly skilled craftsmanship, attention to detail and dynamic performance. The Bentley Handbag Collection transfers the functional luxury of our cars into an accessory that women can cherish. Dr. Ariane Reinhart, Member of the Bentley Board for HR, has spearheaded this star lifestyle venture to introduce more women to the brand and attract new female customers who share a passion for exclusive, high-quality goods. "More than luxury vehicles, Bentley's models today are capturing more and more women's hearts through their elegant lines and flawless materials," said Dr. Reinhart. "As increasing numbers of women around the world enjoy greater professional success and economic status, so have they developed a taste for refined, exclusive products." The Collection features two distinct models - The Barnato and The Continental. The Barnato is named after Diana Barnato, socialite daughter of Woolf Barnato, one of the original 'Bentley Boys' and Chairman of the company. She was an experienced Bentley driver and an accomplished aviatrix. Diana was the first British woman to break the sound barrier and always portrayed both daring and glamour in equal measure. The Continental is named for one of Bentley's famed model lines, used on successive generations of Grand Tourers since 1952 and the underpinning of the brand's current success since the two-door Continental GT coupe was launched in 2003. "Just as the Bentley Boys are our historical racing heroes, and an iconic part of the brand, today there is an emerging culture of confident and successful women, 'Bentley Girls', with the same adventurous spirit. We are creating this luxurious and stylish handbag series to appeal exclusively to these modern women," Dr. Reinhart added. Bentley's Head of Product Design, Daniele Ceccomori, has worked closely with renowned luxury leather bag designer and expert craftsman Vincent du Sartel to bring to life a wholly feminine interpretation of Bentley's design concepts, highlighting the brand's contemporary elements. "With the actual design of the handbags we wanted to create a strong link with some of the key features on our cars," said Ceccomori. "Starting with the exterior profile and volume, we have drawn inspiration from the iconic shape present on the rear aspect of the boot lid of the car; the split side panels echo the wing-shaped buttresses of the interior dashboard and help to enhance dynamism and elegance, allowing to play with different material and colour finishes, a classic Bentley bespoke feature." Inside, the handbags' unique level of features and finishes are offered to evoke the same exact impression of when stepping inside a Bentley; they are exclusively lined all in fine leather with quilting features and functional compartments, including a waterproof pouch, elegantly blending core Bentley aesthetic values with everyday functionality and practicality, like a Bentley car. The Bentley Handbag Collection is available from October 2013. This limited edition collection comprises 160 bags globally, 80 of each style, in four colourways. This palette of options will be expanded in 2014 to include new models.